In a historic moment, Shinzo Abe has become the first Japanese leader to visit Darwin, Australia, since it was bombed by Japan during World War Two. The first raids in February 1942 left about 250 people dead, hundreds more injured, and destroyed numerous Allied ships as well as much of Darwin itself. 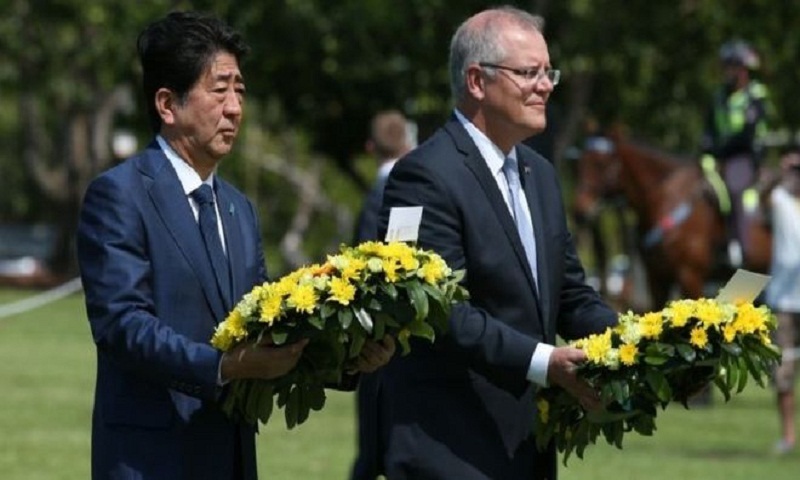 Mr Abe joined Australian PM Scott Morrison in laying wreaths in a solemn ceremony at the city's war memorial. Mr Morrison has described the visit as a "time of healing" and friendship. The leaders observed a minute's silence, remembering the worst wartime loss of life on Australian soil. They also paid respects to 80 Japanese sailors who died when their submarine was sunk off Darwin in January 1942. Mr Abe and Mr Morrison did not speak publicly at the ceremony on Friday, but were expected to release a joint statement. The bombing of Darwin began 10 weeks after the attack on Pearl Harbor in Hawaii, and only days after the fall of Singapore. There were 64 raids on Darwin until November 1943 but most did not cause casualties, according to the Australian War Memorial. In 2016, Mr Abe joined then US President Barack Obama in visiting the US naval base at Pearl Harbor. Japan and Australia have built their relationship with security and trade pacts in recent years, despite occasionally straining ties over whaling. Mr Abe's visit coincides with the official opening of a major LPG (liquid petroleum gas) processing facility in Darwin that is intended to boost Japan's energy security.